That's a nice touch for us keyboard shortcut users. The ALT+Letter combination possibilities come up. This gives one the chance to get familiar with the new ways of keyboarding around the interface. There are certainly a greater number of steps to achieve the same tasks as before, however, there are now a whole new set of keyboard shortcuts for commands that one would have had to manually create in Office 2003. We have the traditional key strokes, and then a few new ones for some new sub menus. 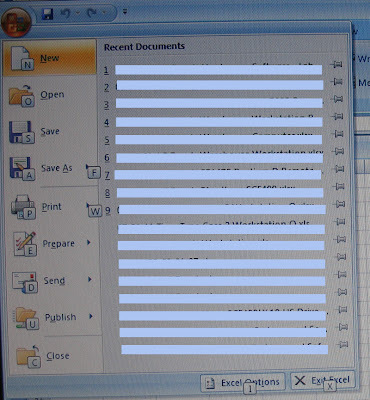 The blue lines represent previously opened files in Excel, Word, etc. I do like the fact that we are no longer restricted to 9 previously opened files. The learning curve involved with the new key strokes is not too steep. It will not be too difficult to pick up for those of us who use our keyboards more so than our mouse to get around a program's interface.